One of the many stand-out moments in last year’s Captain America: Civil War was seeing Peter Parker aka Spider-Man finally interact with established characters in the Marvel Cinematic Universe like Iron Man, Captain America, Falcon and whoever else was in that awesome airport fight scene. It was especially momentous for fans because, after years of Sony controlling the strings and not allowing what is arguably Marvel’s most popular character in both comics and film to appear on-screen with other heroes in the Disney-owned MCU, it represented the first in a multi-film deal that would allow Spidey to be a part of that much bigger universe while also standing on its own as a rebooted (again) series for Sony. So, from that point of view, the moment that Parker finally met Tony Stark in Civil War was a historic moment in comic-book movie history, and set the bar high for any future appearance of the red-and-blue web-slinger. Now, he’s front and centre in his first standalone film as part of the MCU, and not only is Spider-Man: Homecoming destined to endlessly please fans that have wanted him to exist in this universe since it first began, but it’s easily the best Spider-Man movie since 2004, in terms of how it nails the character and the world in which he inhabits. Parker, once again played by Tom Holland, is first seen returning to his mundane life in Queens, New York after the events of Civil War, awaiting the next call to arms from his adopted mentor Tony Stark (Robert Downey Jr., who despite his heavy appearance in the marketing is not in the movie that much). He passes the time surviving high school as his normal self, competing on the school decathlon team, ogling pretty senior student Liz Allan (Laura Harrier), and building a LEGO Death Star with his best friend Ned (Jacob Batalon); and also, once he’s finished the school day, swinging through the streets of Queens as Spider-Man and helping residents with their everyday crimes. Peter, however, is desperate for much bigger villainy to foil, and gets his chance when he uncovers a crime syndicate that has harvested alien weaponry from previous Avengers battles and is selling them on the black market, but in doing so he incurs the wrath of Adrian Toomes (Michael Keaton), a former scavenger turned criminal who thwarts Spidey’s missions as the mechanically-winged Vulture. Thankfully, there’s no rehashed origin story or Uncle Ben telling us what comes with great power for the millionth time here; both of these elements are brushed aside entirely, mentioned only in passing or heavily implied through dialogue (Peter notes of the “hard time” that his Aunt May, played here by Marisa Tomei, has gone through lately; you put two and two together), and in their place we get plenty of scenes of Spider-Man just being Spider-Man, going about his neighbourly duties and keeping his toes firmly in his Queens neighbourhood for the most part. Out of all the big-screen incarnations of the character thus far, this one is by far the closest to the comics and the one that balances out Peter Parker’s dorky awkwardness with Spider-Man’s wise-cracking attitude perfectly. Holland is truly great here, embodying both aspects of the character and nailing both Peter Parker and Spider-Man to a tee, whereas in the past Tobey Maguire definitely got the nerdy part of the character down but not necessarily Spidey himself, and Andrew Garfield vice versa; Holland is a perfect mixture of both, and delivers what is to date the most lovable and wide-eyed version of him yet, whether he’s awkwardly ogling hot girls in his class or fighting crime on the streets. He’s a great addition to the MCU, and hopefully he’ll have a large part to play in the upcoming Avengers movies because he’s someone who would absolutely deserve to have a shot against the evil Thanos (provided the big baddie can actually get off his space toilet for the battle). Director Jon Watts, coming off the beloved but little-seen indie Cop Car as well as the similarly little-seen horror film Clown, brings a genuine sense of joy to the character through scenes that naturally explore his identity both as Peter Parker and as Spider-Man, which are funny as well as refreshingly grounded. In comparison to a lot of the other MCU movies, this is very low-key and it’s a sigh of relief that this isn’t just another “superhero must stop a villain from taking over the world” plot that seems to be the formula for a lot of these Marvel movies (though don’t get me wrong, it’s a formula that definitely works); and speaking of villains, Keaton is gifted with having to play the most humanised MCU villain to date, and even when he’s doing some pretty evil stuff you can still sympathise with his cause and even some of his home life too (no details on that, though, because that would be an unwanted U-turn into spoiler territory). While not necessarily the most interesting villain, Keaton is pretty intimidating as this blue-collar guy who is put into this rotten situation as a direct result of actions from previous MCU films, so it’s kind of fascinating to know of the small-time damage that these big heroic fight scenes bring to people like him, and again you sympathise with his cause to a point cos, y’know, bad guy. However, since this is the first Spider-Man movie to be set in the MCU, and presumably to make up for his not being so in the past, this movie throws in a LOT of references to other elements in this universe; I swear this movie says Tony Stark’s name more than Spider-Man’s, although Captain America shows up in a number of pre-filmed PSAs throughout the film (which I hope the DVD and Blu-Ray has plenty more of, because they’re pretty damn hilarious). If you’re the type of person who gets easily annoyed by all these world-establishing references, and just wants the film to exist on its own without all these call-backs, you’ll probably come out of this feeling no different than before, so you have been warned. 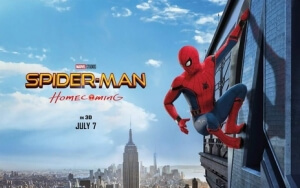 Spider-Man: Homecoming is an enjoyable new version of the popular Marvel character that integrates him into the Marvel Cinematic Universe wonderfully, with some strong and grounded direction by Jon Watts and an intimidating villainous turn by Michael Keaton, although be prepared for the constant bombardment of references to other MCU properties which may or may not irritate you depending on your enjoyment of the MCU as a whole, but aside from that it’s a movie worth swinging towards.